Environmental Protection Minister says Labor leader Avi Gabbay learned to zigzag from Yesh Atid Chairman Yair Lapid. 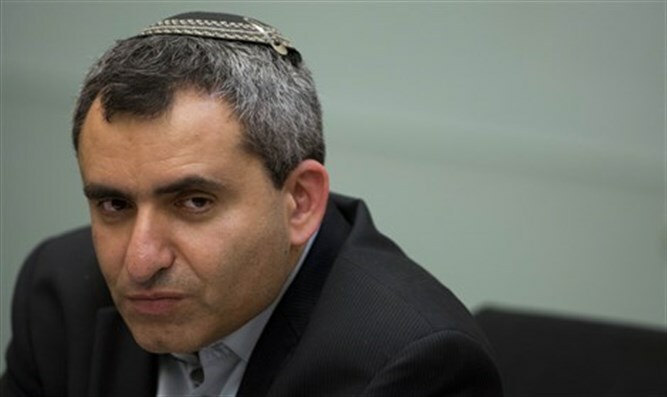 Environmental Protection Minister Zeev Elkin (Likud) spoke to Kol Barama Radio on Wednesday morning about the Diplomatic-Security Cabinet's decision not to negotiate with the Palestinian Authority (PA) until Hamas disarms. On Thursday, the PA signed a reconciliation agreement with Hamas. According to the agreement, the PA will resume full control of the Hamas-controlled Gaza Strip by December 1. "I am very skeptical about whether Hamas will actually put down their weapons," Elkin said. "The Cabinet sent a very clear message to Palestinian Authority Chairman Mahmoud Abbas, telling him that we cannot speak to anyone who makes peace with Hamas." Elkin also spoke about Labor leader Avi Gabbay's declaration that "if we succeed in reaching a peace agreement, then...creative solutions should be found in order to avoid evacuating settlements." According to Elkin, Gabbay learned this tactic from Yesh Atid Chairman Yair Lapid. "When the leftists protest, he says he's a leftist; when the rightist protest, he says he's a rightist," Elkin explained. "But anyone going over the Zionist Union's party list knows that the Zionist Union is a radical leftist party, the likes of which has never been known before." The Zionist Union is a joint list made up of Labor, Tzipi Livni's defunct Hatnuah party, and the Green Movement. Elkin also responded to Yediot Aharonot's Wednesday report that Israel Police Commissioner Roni Alsheikh received threats. "These are rumors," Elkin said. "These are sentences one person heard another person say he heard somewhere. The fact that Yediot Aharonot chose to publish it as their main article, instead of in an article listing Cabinet decisions, shows what the newspaper's true agenda is." According to Yediot Aharonot, Alsheikh received threats claiming that Israeli Prime Minister Binyamin Netanyahu was not happy with him, and that he would soon be attacked. The report claimed that an acquaintance had warned Alsheikh that he was being carefully watched, and that Netanyahu's staff called him "ungrateful" and a "cheater."